Founded in 1890, Englewood Health is a leading provider of high-quality, comprehensive, and humanistic care serving northern New Jersey and beyond. 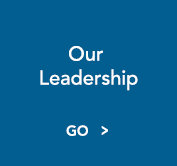 Englewood Health is one of New Jersey’s leading hospitals and healthcare networks. 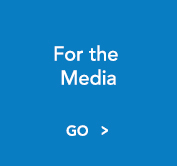 Composed of Englewood Hospital, the Englewood Health Physician Network, and the Englewood Health Foundation, our health system delivers nationally recognized care in a community setting to residents of northern New Jersey and beyond. The hospital, founded in 1890, consistently earns high marks for clinical excellence and patient safety. Englewood Hospital is a “Best Regional Hospital” according to U.S. News & World Report (2017-2018) and is among the top 5% of hospitals in the nation to earn the 2018 Healthgrades Patient Safety Excellence Award. The hospital is also nationally recognized for nursing excellence, earning a fourth consecutive designation by the Magnet Recognition Program® in 2016. Areas of clinical excellence include cardiac surgery and cardiac care, cancer care, orthopedic surgery, spine surgery, vascular surgery, and women’s health, as well as bloodless medicine and surgery. The hospital offers an internal medicine residency program, sponsored by Hackensack Meridian School of Medicine at Seton Hall University, and serves as a training site for surgery, vascular surgery, pathology, emergency medicine, anesthesiology, and critical care medicine, as well as other medical and surgical subspecialties. Englewood Health is deeply committed to serving patients and the community when, where, and how they need care. We are continually expanding services and enhancing access through the Englewood Health Physician Network. This coordinated network of office-based and hospital-based providers, connected through a single electronic health record, offers primary care and specialty services at more than 75 locations in six counties. Our focus on population and community health extends to partnerships with other organizations to enhance individual and public health, prevent disease, support lifelong wellness, and meet the cultural, social, and holistic needs of specific populations. Through our main acute-care facility, physician network, offsite diagnostic imaging centers, and a variety of community health and wellness programs, Englewood Health delivers a healthcare experience that puts patients at the center. For us, relationships are at the heart of providing excellent care, and we take the time to understand our patients and deliver what is important to them in their healthcare experience. To be the regional leader in providing state of the art, compassionate care in a humanistic environment. 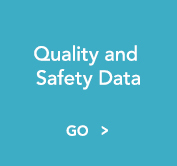 To provide comprehensive, state-of-the-art patient services; emphasize caring and other human values in the treatment of patients and in relations with their families, and among employees, medical staff, and community; be a center of education and research; and provide employees and medical staff with maximum opportunities to achieve their personal and professional goals. Reaching New Heights: A 5-Year Progress Report provides high-level insights into many areas of our growth and accomplishments between 2013 and 2018. 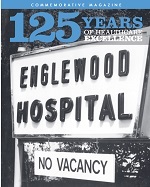 In 2015, Englewood Hospital and Medical Center celebrated 125 years of medical excellence and service to our community. We opened with a clear mission: “to care for, nurture and maintain” the sick, injured and infirm. Since admitting our first patient, on June 25, 1890, in a 12-bed wood-framed building, our story has been one of steady expansion and modernization, increasingly specialized expertise, and a steadfast commitment to providing outstanding medical care to our neighbors in a humanistic environment. 2013 Bergen County Community Health Needs Assessment produced by the Community Health Improvement Partnership of Bergen County and companion document that details Englewood Hospital and Medical Center’s specific goals and strategies. The Englewood Health Foundation raises funds to support patient care, programs and services at the medical center. You can make a meaningful difference for countless patients and families. 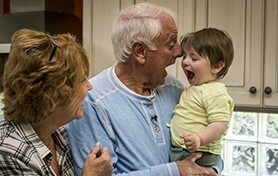 As a nonprofit community hospital, Englewood Health relies on the generosity of volunteers to help fulfill our mission. Opportunities are available for both high school students and adults in both patient care areas and administrative work. Learn more. To find a physician, call 866-980-3462. See full directory or contact us online.